Even though the streets are narrow (24 ft.), NYC DOB consider the Place blocks, and Carroll, President, and Second Streets between Hoyt and Smith as wide streets when considering the FAR of a zoning lot. 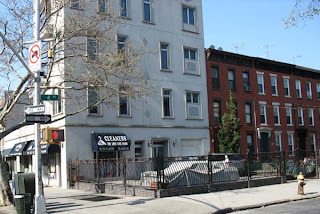 This allowed developers extra floors on this building at 116 Third Place. Illegal parking in the courtyard at 100 Fourth Place. 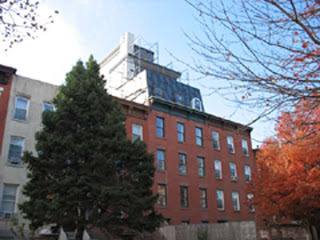 The area of Brooklyn now known as Carroll Gardens was laid out in the mid-1800s with great foresight, by the surveyor Richard Butts; and the neighborhood’s signature courtyards were created by law in 1846 and 1850 as a neighborhood easement. His “Map of the City of Brooklyn and Village of Williamsburgh,” showing the size of blocks and width of streets as laid out by the Commissioner, the old farm lines, water line, and all recent changes in streets, shows that between Henry and Smith Streets, the five streets of Summitt, Woodhull, Rapelje, Cooper and Coles were to be altered to provide for four new streets, First through Fourth Place, that were be 50 feet wide. The metes and bounds that formed the neighborhood’s “Place” blocks, courtyards, and width of the streets, was legislated in old Brooklyn law in 1846 and 1850, and is attached to the deed of every property on the “Place” blocks. The courtyards are protected by this covenant, owned by the City, and considered part of the street, with the property line beginning at the building line. The old Brooklyn law creating the courtyards was transferred into the New York City Transportation Code. The old Brooklyn law specifically notes the northern and southern limits of the streets, with respect to a starting point of the street, clearly indicating that the street line begins at the sidewalk edge, not at the building line. The law also clearly lays out the width of the street (two 13-foot sidewalks and a 24-foot "carriage way") equaling 50 feet. Interestingly, Butts elected to eliminate one street in the normal street grid and then evenly divide up that left over space to create courtyards on the "Place" blocks, between the street lines and the building lines. When City Planning mapped the courtyards as part of the street in the early 1960s, it included the two 33.5¼ feet courtyards as part of the 50-feet street, resulting in a 117.5 foot street. Since zoning allows a higher FAR for “Wide Street”, or streets wider than 75 feet, this has allowed developers in recent years to take advantage in this quirk in the interpretation of the law that created the courtyards. Even though the streets are narrow, this produced an opportunity for developers to add extra stories that are out of character with the brownstone row houses. Since the early 1990s, another problem threatening the integrity of the courtyards is that the Departments of Transportation and Buildings began issuing curb-cut permits to property owners, who wanted to park their cars in the courtyards. We were told by City Planning that it is probably because in an R-6 zone, if there is 18-feet or more footage in front of a property, that DOB will allow a property owner a permit. The problem with resolving this issue is that the courtyard restriction is in the Transportation Code, and not part of the zoning resolution, and neither DOB nor DOT will claim jurisdiction to resolve this problem, and the Department of Planning says it is an enforcement problem.